She has been performing for more than 20 years as a Solo; Duo and as the featured vocalist with a 5 piece band. She currently has released two albums (”’Ain’t Down Yef’ and “Growing Up Country”) with her third CD now in production. During and after her Tribute to Patsy Cline Show” she interacts with the audience with trivia questions about Patsy’s life and poses with fans for pictures. She is a professional from the moment she enters a venue and is very easy to work with. She is warm and personable with both her audience and management. She is always pleased with the wide range of ages that are in the audiences of her Patsy shows …..”Patsy’s songs still draw interest from so many age groups”. She utilizes custom “State Of The Art” audio /visual material to enhance the presentation of her stage performance and to provide a memorable show. 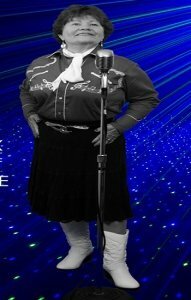 Her performance of her tribute show consists of 20-30 memorable Patsy Cline songs that are always a hit with Patsy’s fans. If you are looking to book an entertaining evening of quality music and a stroll down memory lane…. 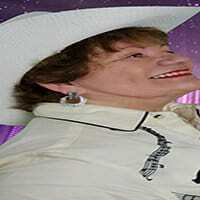 Her “A Tribute to Patsy Cline Show” is the perfect act.